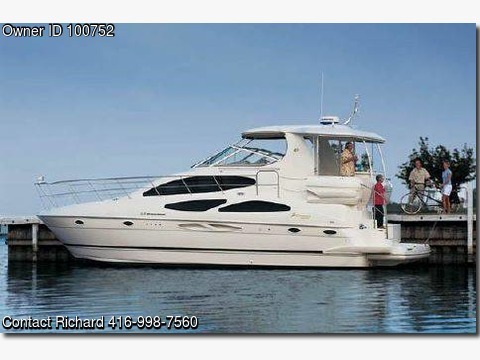 Boat is located in Miami,Florida.Please contact the owner @ 416-998-7560 or cruisers405@gmail.com...This stylish model is a hybrid of express cruiser hard top and flybridge. It has been stored shrink wrapped at the dealership since new and has only spent one season in salt water. Whether living aboard or cruising the Bahamas the extremely roomy design makes use of plenty of natural light and has two well appointed staterooms with walk around queen beds, two heads and two spacious showers. The mattresses were just custom made and have a luxurious/cool bamboo topping. The twin Yanmar 370 hp diesel engines have a top speed of just over 27 knots with a cruising speed of 22 knots at 3000 rpms. It is equipped with auto tracking satellite TV which feed TV'S in 3 separate rooms. Powerful 11 speaker stereo system with audio controls in each room, dvd player, cd player. Recent new bottom paint, polish and wax, seven new batteries and fluid and filter changes have this boat in turn key condition. For boating enthusiasts the 405 has a virtual express layout on the upper deck while providing full aft cabin comfort below. The 405's cockpit features the kind of comfortable seating associated with traditional express boats with virtually no separation between bridge and cockpit. A full express-style windshield provides exceptional weather and wind protection. An aft-deck hardtop with wing doors and full weather enclosure hard top extends over aft deck. Below, the 405 Express Motoryacht will delight owners and guests alike with its warm cherry interior and natural light. The bright, airy salon features a large convertible dinette, comfortable L-shaped sofa with sleeper and double incliners. The salon has a wonderful view all around due to the imaginative window treatments on each side. There's also a fully appointed galley with large, upright refrigerator/ freezer. A luxurious master stateroom is located aft and features a full walk-around queen-size bed, generous master head with separate shower and lots of seating and storage. A second queen stateroom is located forward with private head access and separate shower; it also boasts a centrally located queen-size bed in the salon. This 2005 Cruisers 405 Express features a hard top, a comfortable air conditioned bridge and a full windshield with wipers and washers. This 405 blends a motoryacht interior roominess and privacy on the lower level together with the fun and comfort of an express cruiser on the bridge level. She sports two staterooms, two heads, two full sized showers, a fully equipped galley, spacious salon and an aft deck equipped for entertaining.Call or email for full specs.